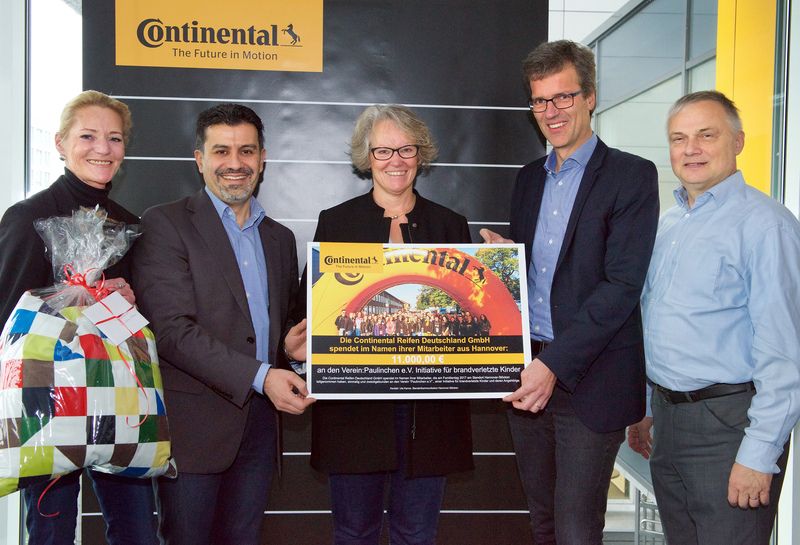 Around 2.680 employees of Continental at the location Hanover-Stöcken and their families donated entrance fees from this year’s Family Day to Paulinchen e.V. Hannover, December 12, 2017. The employees of Continental in Hanover-Stöcken have collected 11.000€ during their family day celebration in September 2017, which have today been donated to the association ‘Paulinchen e.V.’. „The association Paulinchen e.V. has been suggested by one of our employees and meets the focus of our corporate social responsibility activities at the location”, said Dr. Bernhard Trilken, Location Manager Hanover-Stöcken, during the handover of the donation to Susanne Falk, Vice Chairwoman of Paulinchen e.V. (v.l.) Uta Kanne, Hasan Allak (both Continental), Susanne Falk, Paulinchen e.V., as well as Dr. Bernhard Trilken and Prof. Dr. Thomas Winkelmann (both Continental). The money had been donated during the Family Day, an event dedicated to the employees at the location Hanover-Stöcken and their families, which had taken place on September 16, 2017: Continental celebrated with employees from various departments and their families together at the location’s site. Besides fun and games, there have been many interesting insights to production processes, detailed looks behind the scenes, as well as fascinating guided tours for all age groups. All adults older than 15 years paid an ‘entrance fee’ of 5 €, and all proceeds have today been donated to the charity association Paulinchen e.V..
Paulinchen e.V. commits itself since years to support children with burn injuries and their relatives. The association offers counselling after scalding and burn injuries of infants and children to affected families and their relatives. Among their main tasks is the counselling and contact mediation during hospitalization, assistance during rehabilitation and beyond, as well as preventive measures.